The combination of the names Sam Peckinpah and Steve McQueen on this entry of the 101 Action Movies told me I would be getting something awesome, and The Getaway did not disappoint. And let’s just get this out-of-the-way, Ali MacGraw looks amazing in this film. McQueen plays Doc McCoy, who after 4 years in prison is getting out early thanks to his wife, Carol’s (MacGraw) dealings with a corrupt business man Jack Beynon (Ben Johnson). He’s a man out-of-place the moment he gets out, and Beynon has a job for him, a bank heist that will pull them in half a million dollars (hey, it was ’72). Beynon decides who McCoy’s crew is, and right away you know that is going to cause a problem. And it does, when Frank (Bo Hopkins) loses his cool and kills the bank guard. In return, Rudy (Al Lettieri) kills him, and plans to double-cross the McCoys. Doc gets the drop on him, and thinks he puts him down, not realizing that Rudy was wearing his bulletproof vest. As Doc and Carol flee for the border, Rudy and Beynon’s men set off after them. And they all seem to be heading for a brutal final showdown. McQueen has always been amazingly cool in my book, and under Peckinpah’s direction the two of them craft a well put together film, that sees the McCoys racing to escape the law, and their enemies, while trying to figure out if they still fit into one another’s lives. I loved how the opening credits were cut, showing the monotony of prison life for Doc, as he’s alternately in his cell or working, they all blend and run together, until it’s just a blur and you can tell he’s close to the breaking point. The entire run of the film shows McCoy barely containing a level of anger that seems to just simmer below the surface, threatening to explode at any minute, with anyone being the victim of it. MacGraw is fantastic as Carol, from obviously seducing Beynon to help get Doc out, to her small smiles, to her arguing with him about their lives, and if they even have a relationship anymore. The action sequences are as intense as you would expect from the director of The Wild Bunch, and the body count climbs through the course of the film. For all of that, there are moments of humor as well, McCoy interacting with the kid on the train, the odd relationship Rudy develops with Fran (Sarah Struthers!) as he pursues the McCoys, and of course Slim Pickens brief appearance as the Cowboy. With a script by Walter Hill, who also created the late 70s classic Warriors, 48Hrs, and helped create the story for Aliens, based on Jim Thompson’s novel the film rockets along with a gritty realistic style, and Peckinpah puts it all on the screen. The action films of the 1970s now seem to be in full swing, and there are some brilliant titles to come, which I have never seen but am looking forward to! 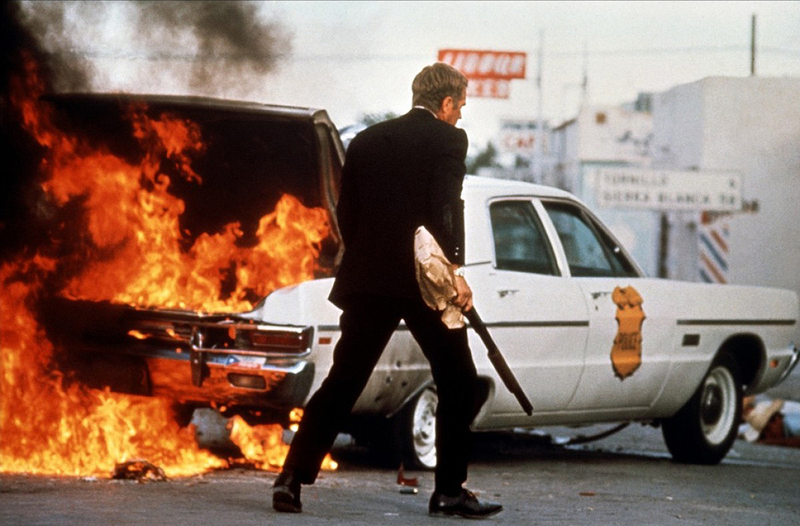 Disaster movies, cop films, blaxploitation, and some cult classics… oh yeah. What’s your favorite McQueen film? I think my favorite McQueen will always be The Great Escape–one of my favorite movies as a kid. Great Escape will always be my fave!